Rudy reaches 50 career goals. Hill to play soccer at Penn State-Altoona. 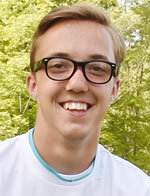 Hill headlines All-Region boys soccer picks. Hornets fall to East Juniata in District semis. 4 Hornets named to NTL All-Star soccer team. Hornets shutout Galeton 2-0 in Districts. Hornets top Sayre 3-1 on Senior Night. Hornet soccer blows past Coudersport, 7-1. Hill, Runyan notch hat tricks in 10-2 win over Troy. Hill becomes all-time scoring leader in loss to Athens. Hornets top North Penn-Liberty in 2OT. Hill's 5 goals push Hornets past NEB. Hornets take down Lakeland for 7th straight win. Hornet Soccer blanks Towanda, 10-0. Hill becomes Wellsboro's all-time scoring leader. Hornet Soccer tops Sullivan County. Hornets drop third straight game. Hornet Soccer falls to Athens. Hornets fall to South in season opener. Hornets rally in final minutes to beat Loyalsock. Hill scores 50th career goal, shutout NEB 9-0 on Senior Night. Athens hands Wellsboro 2nd loss of year. Hill's hat trick leads Hornets over Sayre. Hornets shut out Towanda, 6-0. Hornet Soccer shuts out Coudersport, 7-0. Hornet Soccer shuts out Northern Potter. Worthington's hat trick leads Hornets past NEB. Hornet Soccer shuts out Sullivan County. Hornet Soccer downs Sayre, 4-1. Hill nets 5 goals to beat South Williamsport. Hornet soccer tops Liberty, 5-2. 13 Hornets selected to NTL Soccer All-Star team. Hornet Soccer shuts out South Williamsport. Hornet Soccer teams pick up wins. Runyan's goal lifts Wellsboro over Troy. Three first half goals propel Hornets to victory over NEB. Hornet Soccer tops Towanda in OT. Hornet Soccer falls to Northern Potter. Hornet Soccer falls to Galeton, 4-2. Hornet Soccer shuts out Liberty, 2-0. Hornet Soccer shuts out Troy, 5-0. Boys Soccer suffers 2-1 loss to Williamson. Boys Soccer shuts out Towanda, 12-0. Hornet Soccer shuts out Galeton. Boys soccer season comes to an end vs. Biglerville. Boys soccer tops Millville in second round of District playoffs. Boys soccer beats Towanda on Senior Night. Boys soccer shuts out NEB, 6-0. Boys soccer falls to Galeton, 1-0. Hornet soccer tops Liberty, 3-1. Hornet soccer shuts out Williamson. Boys soccer falls to Galeton in OT. Boys soccer shuts out Mansfield, 3-0. Boys soccer downs Towanda, 8-1. Wellsboro's Hill chooses Penn State-Altoona. Two locals earn all-region honors. Colegrove heads All-Region boys' team. NTL coaches name 2016 soccer all-stars. Athens' Lane scores 50th goal in win. Athens, ND boys play to a tie. Notre Dame edges Waverly 1-0. Northern Potter, Williamson play to 2-2 tie. Colegrove gets 50th in Athens' win over Towanda. Late rally gives Wellsboro 3-2 win. Wellsboro's Hill earns 50th goal in win over NEB. Athens tops Wellsboro, claims NTL title. Segar breaks scoring record as Athens edges Williamson. Williamson’s Daley scores to top Troy. Martinez, Griffin score twice to give Galeton win over NEB. Troy's Binford gets 50th goal, leads Trojans past NPL. Notre Dame blanks Trumansburg to win tournament title. Towanda boys end 97-match winless streak. Notre Dame blanks Waverly to stay unbeaten. Athens' Ryan Segar nets 50th career goal. Wellsboro boys advance in district playoffs. Troy, Wellsboro boys cap regular season with wins. NEB boys blank Towanda; Sayre boys top Williamson. Wellsboro tops NEB; Sayre, Athens, Troy, Williamson earn wins. Wellsboro boys edge Towanda in OT. Williamson tops Troy; NEB edges Sayre; Galeton beats Wellsboro. Colegrove's goal lifts Athens boys past Sayre. Williams leads Sayre past Williamson. Williamson edges Northern Potter; Sayre, Galeton, Wellsboro pick up wins. Wellsboro tops Galeton; Waverly boys get win. Sayre boys roll past Galeton. Murrelle leads Sayre past NEB. Sayre tops NEB 2-0; Galeton, Athens, Wellsboro, Williamson pick up wins.